Our facilities-and guidelines for using them! New for 2016 Winter Fire Pit -with The View!!! 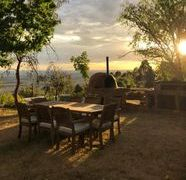 We have created (from a pile of large rocks on the S/W view side of the homestead) a fire pit and multiple seating areas-its lovely and perfect for those still evenings!! Wood can be found in the woodlot for this purpose-many guests bring their own. Wood provided for the Pizza Oven and BBQ can be used but must be replaced! This accommodates up to 15 persons. Homestead-up to 7 persons. The 2 self-contained units- up to 4 persons each. Each self contained has a large en suite bathroom with shower toilet and vanity. 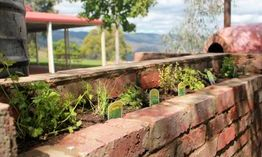 -the 5th cozy (Garden) room has a delightful outlook over lovely gardens and feature rock walls. Please refer to Photo Gallery above for pictures of facilities. All rooms have super-comfortable mattresses with latex pillow top and quality (usually Sheridan) and have High Definition TV with inbuilt SD USB and DVD. The Homestead has a master bedroom (with view) queen bed and ensuite ,another bedroom with queen size bed (and view),Large built in robes.The Garden Room with 2 single beds and one trundle bed.These single beds can be combined into a King bed.There is a bathroom with bath and shower for the Garden Room and the other (view) bedroom. We have a 40 inch Samsung Full HD LED TV installed.There is Panasonic Blu Ray player connected by HDMI cable to it. Floodlights (energy efficient CFL or LED) now installed in the view and outdoor dining areas.Switches are located on the outside brick walls above the power points. The 2 self-contained rooms Each has reverse cycle air conditioner, large ensuite bathroom, queen bed, single bed and trundle bed and storage for clothing and cases,bar fridge and tea making facilities.Table setting for 4 persons and view windows accessing the veranda-where there is an outdoor table setting. There is a full HD Television with inbuilt DVD also SD card(for viewing your photos) and USB game input too! Floodlights are located outside on the view side veranda-switch above power point on brick wall between the units. Linen Bed sheets and towels supplied and currently included in the tariff. TV Reception-is good generally with HD channels from Albury and Benalla available. Wood Heaters use a renewable resource-wood. The pre-industrial atmosphere contained around 580 billion tons of carbon for thousands of years. Now it contains 750 billion tons. The coal and oil reserves waiting to be burned total 4,000 billion tons of carbon. We cannot afford to burn more than a small fraction of this, yet oil and coal companies are looking for still more. Carbon in soils amounts to 1,500 billion tons, a good proportion of it at risk of positive feedback (i.e. global warming). Nearly 90 billion tons is exchanged each year between the atmospheric reservoir and the 39,000 billion-ton reservoir in the oceans. Approximately 100 billion tons of carbon circulates between the atmosphere and the approximately 750 billion-ton reservoir in land plants. Almost a quarter of all atmospheric carbon is cycled down into the terrestrial and marine biota each year, and as you can see it is not the carbon cycle that is the problem, but the coal and oil being burned - additions to the system. The Australian made Metal Dynamics Gourmet Wood Fire heats the house through in-room radiator panels and also heats the Homestead hot water through an internal smoke recycling system-you cant leave the fire door open for this reason. It meets EPA air pollution requirement-one of very few wood heaters with water heating coils to do so.It can also be used as a cooktop-with 2 hotplates built in. Start the fire with all air intakes open(including the ashpan door) and a mix of light kindling progressively adding larger pieces and reducing air supply.The aim is a brightly burning fire as pictured-different sizes and types of wood require different settings.Do not use very large(over 150mm diameter) pieces of wood-these will gradually just blacken then die out. Keep a mix of small and larger sized wood in the firebox and have the right air supply to achieve the bright fire.This is achieved through the flue control at the right hand side(pushed back is fully open-but get it as closed as possible to retain heat in the fire) and the slider knob-which can be seen in the centre of the bottom panel in the pic above. The ash pan door can also be left ajar. It is below the firebox and inside the covering door and has a long lever which has to be lifted to open it. Closing the flue lever as much as possible retains heat in the fire (to warm the radiators and hot water) to increase efficiency and slow the rate of wood consumption.It also reduces smoke and particulate pollution. NOTE The flames should be kept below the roof of the firebox or the water coil there will become superheated and make loud banging noises.To stop these noises shut down the air supply and rearrange wood so flames do not reach the roof of the heater box. After banging subsides progressively increase air supply to a lesser level then maintain a bright fire at that lower level in the firebox. 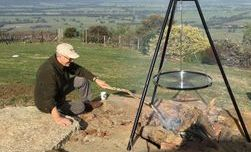 Cooking on the fire-a trick is to make a pyramid of wood-pointing flames up to the hot plate you want to cook on to get quicker heat-e.g for porridge in the morning. The fire and Homestead hot water Every time the fire is operated it is heating hot water in the storage tank in the ceiling by a natural thermosyphon process.This 500 litre tank also supplies the hydronic central heating radiators through the house -when the switch on the wall beside the wood heater is ON to activate the thermostat and pump which circulates water through them AND when the fire reaches the thermostat activation temperature.You can feel the radiators to guage progress. There is supplementary electric heating for hot water if required-ask Jill. The hot water in the homestead is also heated by day through solar evacuated tubes on the roof(102 of them).Water heated in this way is circulated by a solar panel linked via an inline 12v pump to the 500l storage in the ceiling. 1.Hot water from these sources can get very hot!!! Take care with it.Children need to be supervised at all times in showers,using basins The same applies to the wood fire cast iron body-the front area including glass. 2 Please be careful closing the fire door-do not use the door to push wood into the fire or slam the door.A broken door glass is a $200 plus repair which you will be required to pay! This has happened previously. 3.No chopping wood near the house-guests have broken double gazed windows doing this-cost them $400! Wood can be chopped near the wood pile in the back paddock if necessary.We provide sufficient correctly sized wood in barrows near the house. Disability Access As the entire building (homestead and self-contained rooms) is built on a concrete slab there is only one step to manage in order to enter any part of it.We are progressively installing disability support rails at doorways in toilets and showers-also the bath in the Homestead. Three bathrooms are also very large which allows room to manoeuvre. (Note that the toilet in the Homestead General Use bathroom is a standard size). However the Homestead master bedroom ensuite has large spaces within it-as do the 2 Self/Contained rooms. Our large newly renovated kitchen includes a big electric oven with 5 gas hotplates above, a large convection/microwave oven,dishwasher,520 litre refrigerator,red wine fridge with glass storage above and a pull-out pantry and a crockery storage cabinet.A wide range of condiments are available in the pantry. There is a comprehensive array of cooking utensils and equipment for in-house and outdoor cooking-including mixing bowls and pizza trays and cutters. There is plenty of cutlery and table settings for 20 people indoors (or more). We have a formal dining setting for 6 persons and a further 8 person setting in the Family Room/woodfire area of the large open-plan lounge dining area. We also have a large stainless steel spit (accommodates a whole sheep/pig)which uses gas or charcoal and is available for special events (We need to operate it and there is a charge for hire).We can direct you for the meat purchases.There is also a bain marie and 30 litre hot water urn available for larger functions. 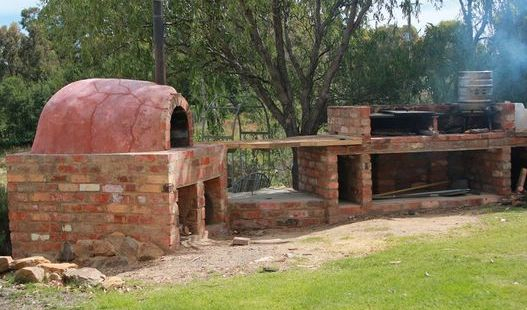 Wood-fired Pizza Oven - now available outdoors for use(free of charge). There are tools(ash scraper,pizza peel) underneath the adjacent wood fired BBQ.Wood provided. Update April 2013 This area now has a large treated pine tables seating up to 8 persons with market umbrella for the full outdoor BBQ experience with the view and is ALSO floodlit for those dreamy nights !! !There are 6 chairs under a cover next to the meter box nearby. You need to have a vigorous fire going for up to 3 hours before attempting a pizza. Metre long pieces of wood 25-75mm diameter can be gathered around the property and lanes nearby and pushed in as the fire burns. You move the fire away from where you are going to cook the pizzas with the ash pusher and the fire should be reaching towards the roof.Then cook on that hot (300+ deg C) base.We have laser type temperature gun to point inside to determine temperature.You can throw some flour into the cooking area and see if it browns.Or put your hand quickly inside-if its too hot to bear its ready! Tools under BBQ adjacent. For me, making the fire and pizzas is a 3 glasses of red task!!!! 3 pizzas(280-300mm) can be cooked at one time.Note-the door of the pizza oven is 320mm wide and 280mm high which is the size limit for items placed inside.Pizza trays are in the storage drawers below the oven in the kitchen. You could make up some bread or bread rolls to use the waste heat after pizza making.Try Laucke Bread Mix-available at the supermarket and follow the instructions on the packet. Note-You need to close off the opening to cook bread, pot roasts etc using the left over heat-we just use some bricks for this 'til we get a custom door made up. Please don't use our cut firewood from the back paddock woodpile.It is specifically sized for the woodfire inside and is too big for the Pizza Oven or Mini Spit.Most outdoor cooking failures are due to taking the "easy" option of using our woodfire sized logs that won't burn down to coals in time or dont completely burn. There will be a $20 charge if you use our cut firewood! This all stainless steel spit has a 5 rpm 240 volt electric motor and extension cord.Locate the spit in clear safe spot away from winds and connect to an outside power point. You could buy a few kg of Heat Beads at the supermarket or Ecologs from Bunnings or gather some wood from our woodlot or adjacent lanes thus helping to reduce fire hazard as well.Do not use our cut firewood. Create a fire with a hot ash bed from 25-75mm wood(same size as for pizza fire) before putting the meat and skewer on. Start by pushing the meat-loaded skewer into the motor spindle and tighten the locating nuts.Then place the skewer on the support bracket,push and turn skewer gradually til it clicks fully into the motor connector. (Make sure this is correctly done otherwise the motor could fall off and be damaged. )Put the skewer and meat at the highest (3rd) setting above the fire and located above the best coal bed then connect the extension lead provided to a nearby power point and turn on the motor. Tighten the locking screws on the prongs!! TIP!!! 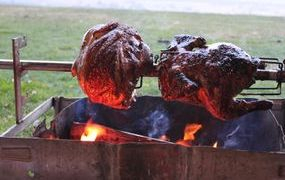 Keep some burning wood in the fire-at the sides and push it under the meat as it reduces to hot coals.Don't let flames touch the meat-this will blacken it and make it look cooked when it isn't.Have spare wood nearby. If you have a hot coal bed with minimal flames you can lower the skewer towards the end of cooking time.Cook for 2 and1/2 to 3 hours otherwise your meat will be uncooked inside.Remember the meat will be very hot-so use dish cloth or similar to handle meat and skewer-and have a suitable tray ready to place the meat on.Rest the meat for 10 min before carving.A bread knife works best for this . Please thoroughly clean the prongs and skewer after use and dispose of hot ash in a safe place Wait a while then wet it!!. Then return BBQ to its spot at the end of the house under cover. Carefully dispose of ash when cold-next day-out of sight, in the garden away from the house. Cooking a chicken,lamb leg or pork piece takes a good 2 and a half hours. Again-for me 3 glasses of red!! Please clean the prongs and skewer and return the kit in good operating condition-ensure the holding screws are still on the prongs! The mini spit in action..Almost ready! Skewer on second setting and prongs set deep in the meat with screws tight,no flames on meat!!!! Be careful when removing meat and skewer-its hot and heavy! You don't want it on the ground after all that care and effort!Turn off and detach motor and then lift the skewer and meats and carefully undo the prong screws.Tap the meat down while placing the skewer vertically on metal tray on a firm table. Remove and rest meat 10 minutes before carving. Adjacent to the wood-fired Pizza Oven we have now completed a large wood fired BBQ with 3 plates and a large hot water boiler. There are fresh herbs for cooking garnishes growing in and under the BBQ structure,There's a cold water tap and a table attached to each end of the structure and connecting it to the Pizza Oven-see pics above. NOTE- DO NOT USE THESE FACILITIES FOR BONFIRES-they are not designed for this. COMING SOON TANDOOR OVEN !!! The covered area and outdoor dining setting for 8 can be supplemented by additional tables and chairs from around the verandas to accommodate up to 20 persons.We also have additional tables and chairs already on site for hire (up to additional 60 persons). The covered area outdoor dining area now features drop down clear blinds for wind and rain protection and creating a huge enclosed area for all weather entertaining. 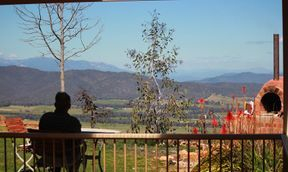 The setting is spectacular-with views over the Murmungie amphitheatre then the Ovens valley to the intervening foothills then the layered distant mountains. Alternatively, sit among the gardens and lawns and rock walls-it can be secluded and intimate! Its your choice! This property in its spectacular setting is perfect for events such as small weddings, family gatherings,business and corporate meetings, executive retreats and other group functions. Quality local catering can be easily arranged -just ask us. The indoor lounge dining area can also be set up for large groups-e.g art groups, sewing groups,card players, business meetings etc using the extra tables and chairs available for hire.